I seriously need to organize my own bullet journal supplies. Check out the photo below if you don’t believe me. 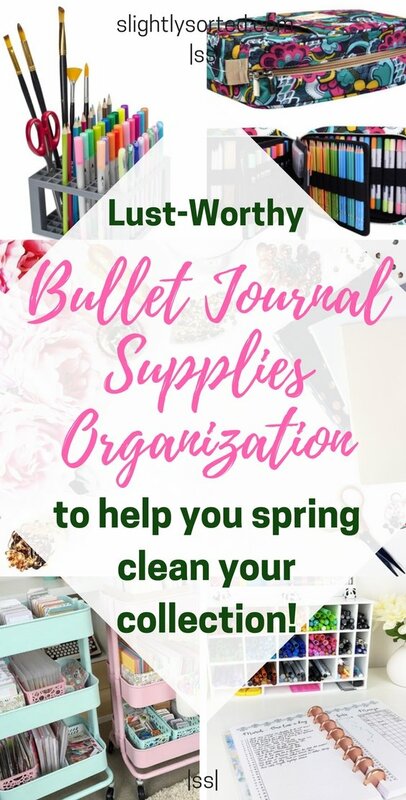 So, in the spirit of spring-cleaning, I’ve been scoping out some of the best ideas for bullet journal supplies organization. There are some fantastic ideas and inspiring images out there to motivate you if you fancy spring-cleaning your own collection. 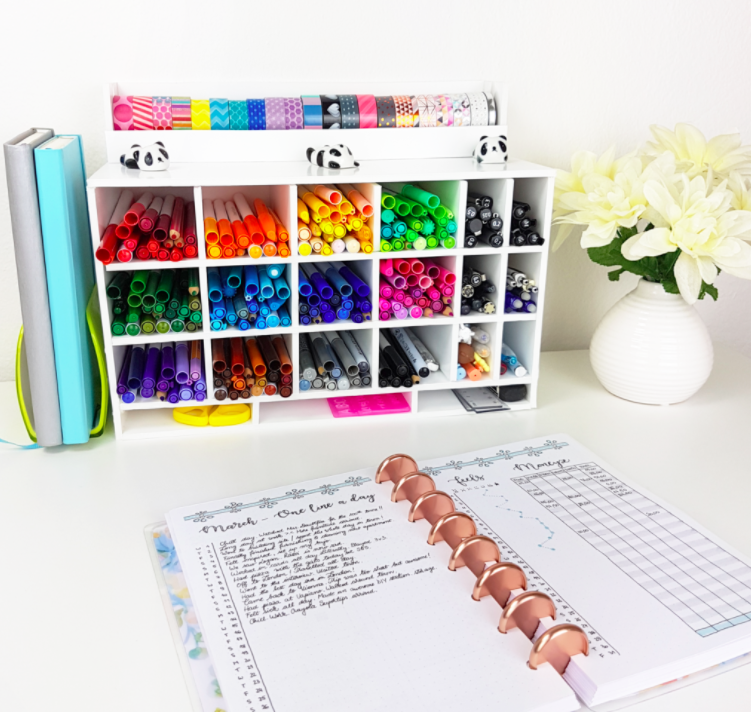 Just looking at some of these gorgeous pictures of ideas for bullet journal supplies organization, should be enough to motivate you to get sorting! 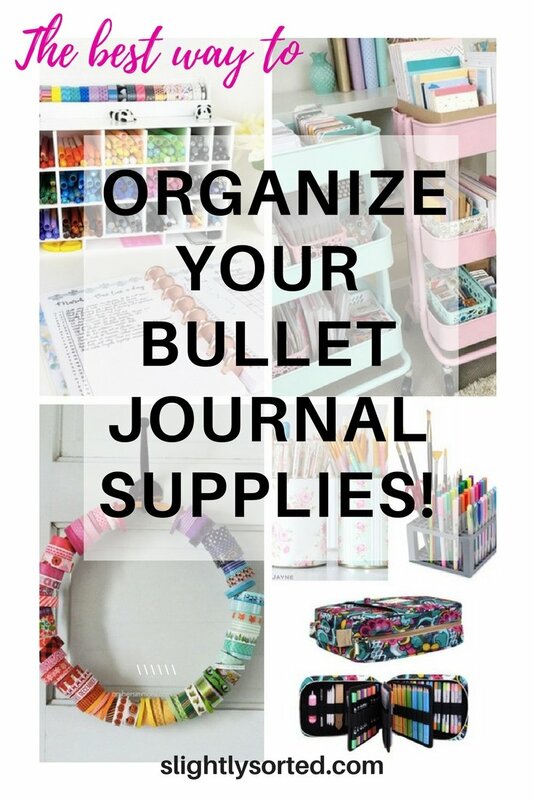 I would love for you to get in touch and let me know how you got on with these ideas for bullet journal supplies organization, and hopefully I’ll be able to update you with a picture of my own perfectly ordered supplies soon!! Above: Just some of my current bullet journal supplies collection – in desperate need of some order! 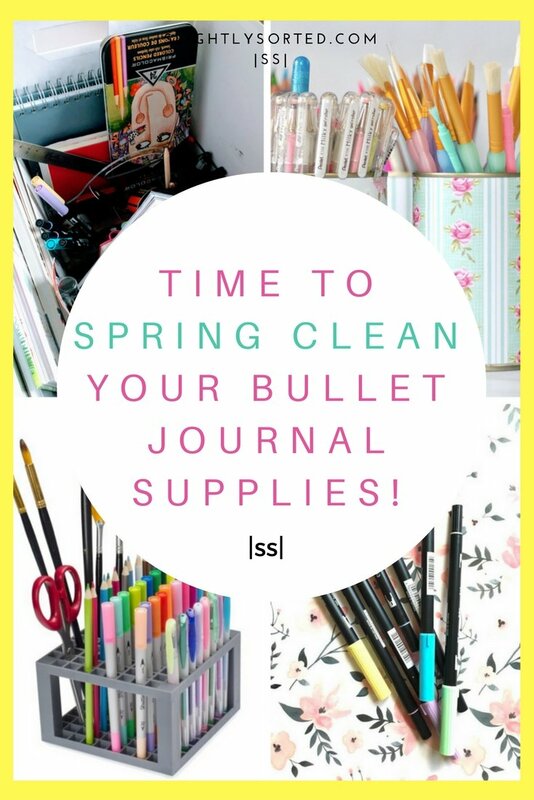 I’ve searched high and low to scope out some of the best ideas for organizing bullet journal supplies (both DIY and shop-bought! ), and here they are. 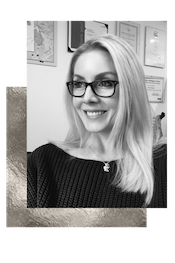 I’ve divided them into solutions for your desk, if you tend to store everything there and do your bullet journaling in the same place, and mobile solutions for when you have to move your supplies from one room to another. Let’s start off with one of the ideas I love the most. 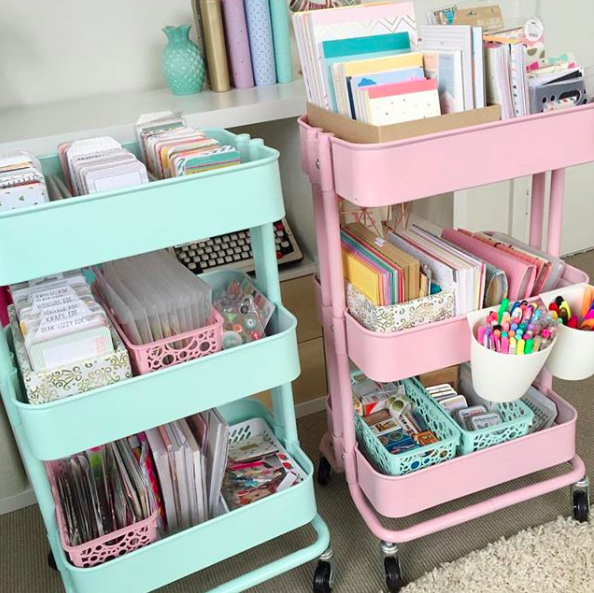 I think this color co-ordinated pen tower is gorgeous, and I love the little washi tape holder on top too! This has been handmade by Cristina of mylifeinabullet.com, who I discovered via her gorgeous Instagram account. I’m rather jealous of her beautiful planning area here! This pen tower took her 2.5 hours to make, and cost less than $10, which is pretty impressive don’t you think? She’s used foam boards and stuck them together using a hot glue gun. Incidentally, I just bought my first mini hot glue gun, to make an Easter bonnet for my daughter, and I’m in love with it – it’s strangely fun and I could happily just glue stuff with it all day long. I digress. If you don’t feel like DIY-ing it, you can buy something similar to use as a desktop pen-holder on Amazon. 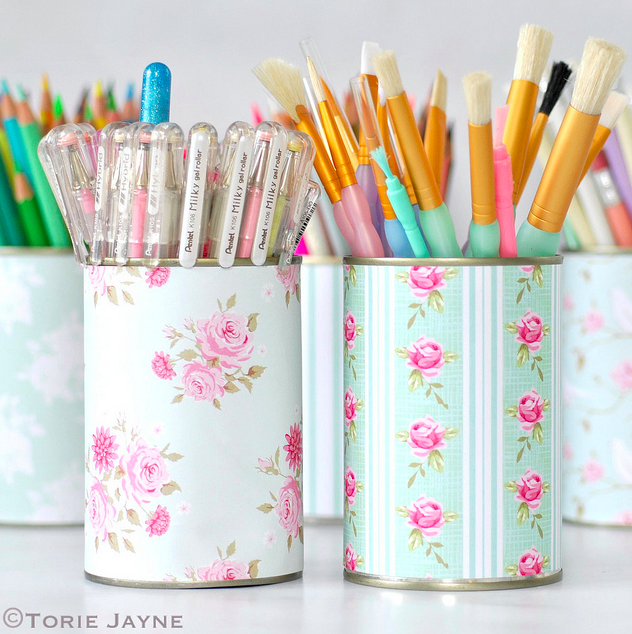 Simple but lovely – these pretty pen pots are handmade with just tin cans, double sided sticky tape, and printed cardboard. Cheap, easy, and pretty – perfect! You can read the tutorial at torijayne.com. 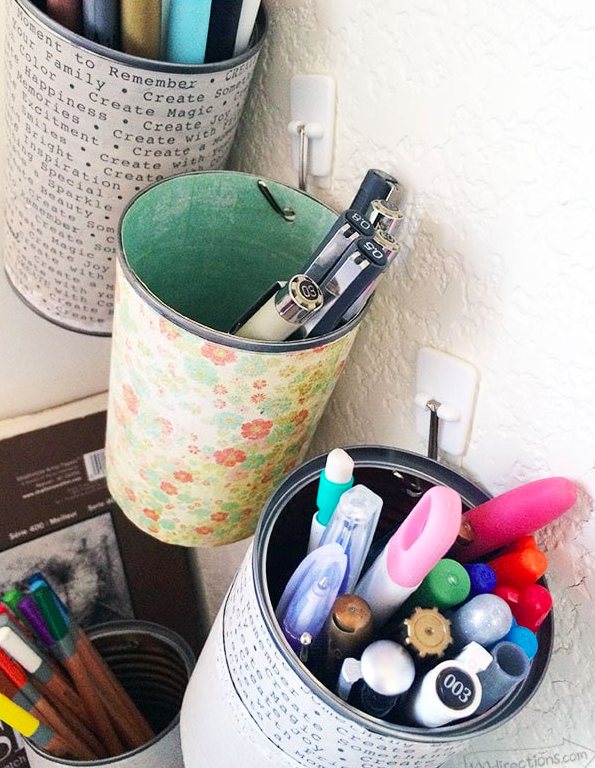 And if you want to get even more crafty (and save some space on your desk), how about some hanging pen pots like these ones on 100directions.com? 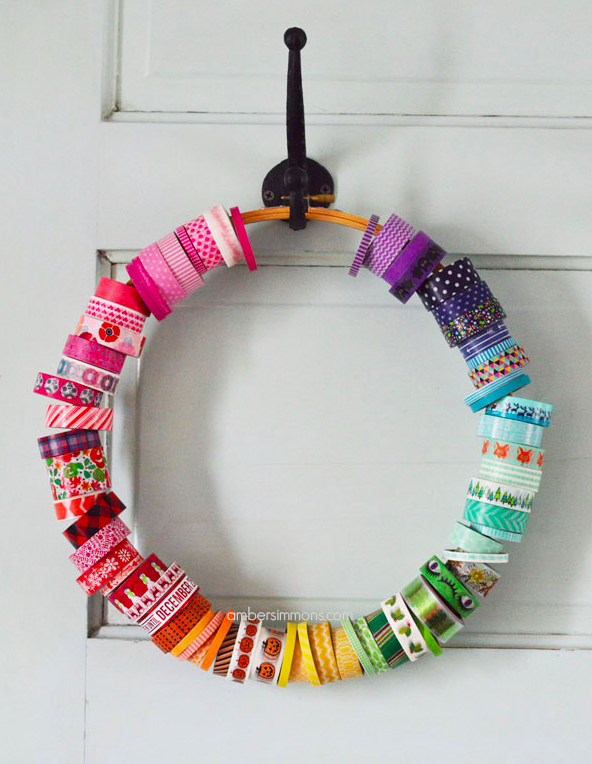 You’ll need to punch a hole in your can (you can use a hammer and nail or a Crop-a-dile), then simply hang them on command hooks – easy peazy! 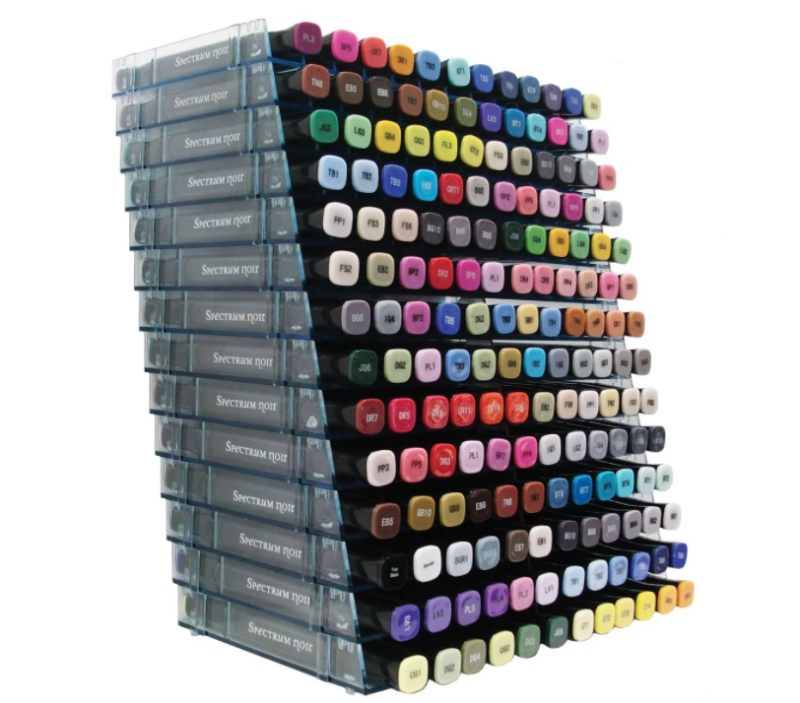 Again, if you don’t have the time to knock up your own pen pots, there are tons of reasonably priced options to buy. If you’re browsing on-line, remember to think outside the box (or pot, haha) and check out makeup brush holders too, as there are some really pretty ones about. 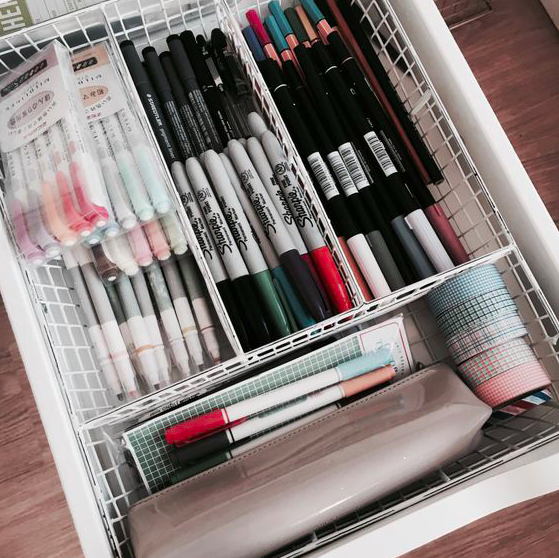 Don’t underestimate the joy that a beautifully organized desk drawer can bring, like this lovely one on studyfulltime.tumblr.com! You can use a ready-made divider like this one, or look forÂ one where you can move the different sections in and out like this one. If you really want to give your planning area an overhaul, and move everything up off the desk surface, how about a peg board like this amazing one on agirlandagluegun.com? As far as bullet journal supplies organization goes, this is one of the more drastic options, but it’s not as complicated as it looks at first glance! 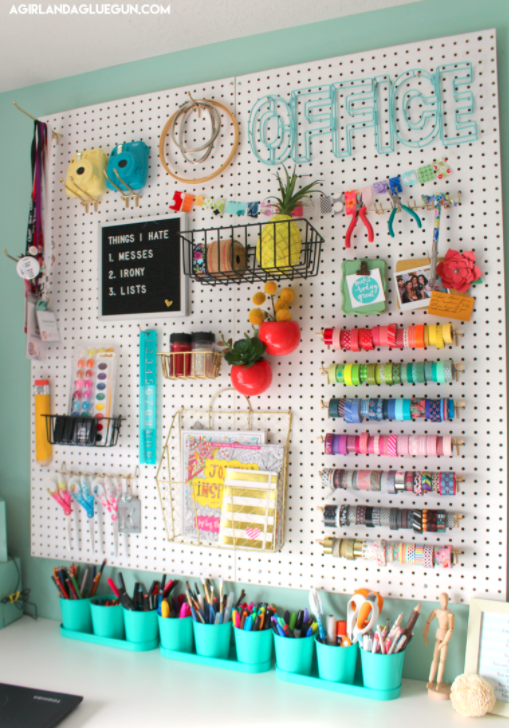 I think this looks gorgeous, and the best thing about it is that there’s not really any way you can get your stuff into a mess, so long as you put things back on the pegboard as you finish using them. 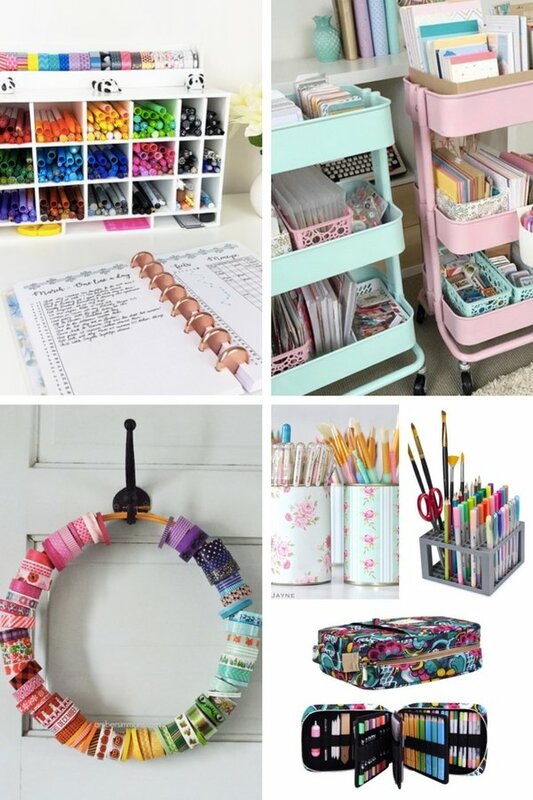 I particularly love the washi tape holders! You can buy peg boards inexpensively on Amazon, and if you’re after a tutorial on putting all of this together, you’ll find it here. If you have as much washi tape as I do (great for lots of bullet journal hacks), maybe you should make yourself a Washi Wheel! I love this idea from ambersimmons.com, which is made using a simple wooden embroidery hoop. Amber has 67 rolls of tape on her wheel here, so it can accommodate a pretty extensive collection (no, I didn’t count them, it says so on her website). If I were making this myself, I would be tempted to paint the embroidery hoop in pink or light purple. 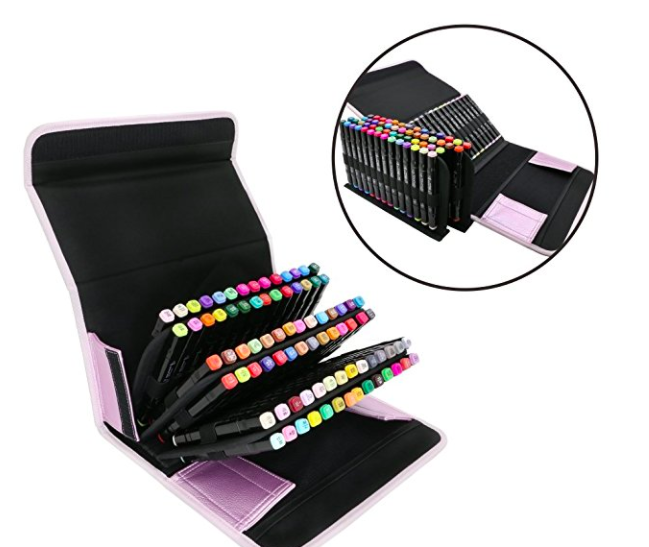 My final idea for bullet journal supplies organization in your desk area, is to check out some of the amazing pen storage solutions on Amazon! Bullet Journal Supplies Organization On The Go! 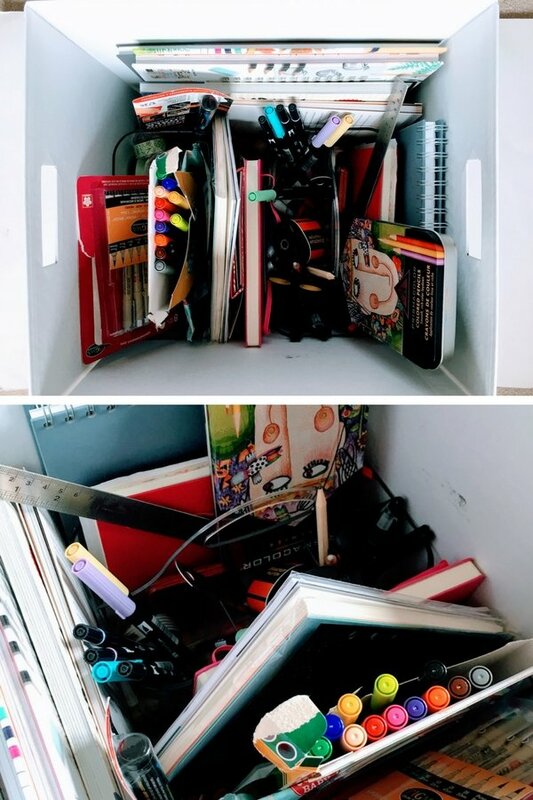 If you have to move your bullet journal supplies from one room to another, you need a more mobile option for your supplies storage. 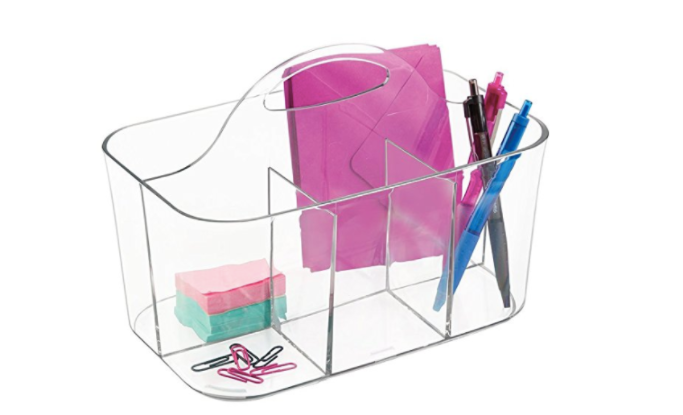 Some of these are great options for on/around a desk too, but they can all be moved about easily. I have a couple of these (you can just about see them in that big box), and they’re really handy for moving smaller selections of pens/tapes/books etc from one room to another. I like the clear ones as you can see what’s at the bottom even when it’s covered by a pile of other stuff, but this mint green version is nice too. I don’t have one of these trollies (yet! ), but I really want one. There are so many amazing ideas for art carts on Pinterest, below are just two of my favorites. 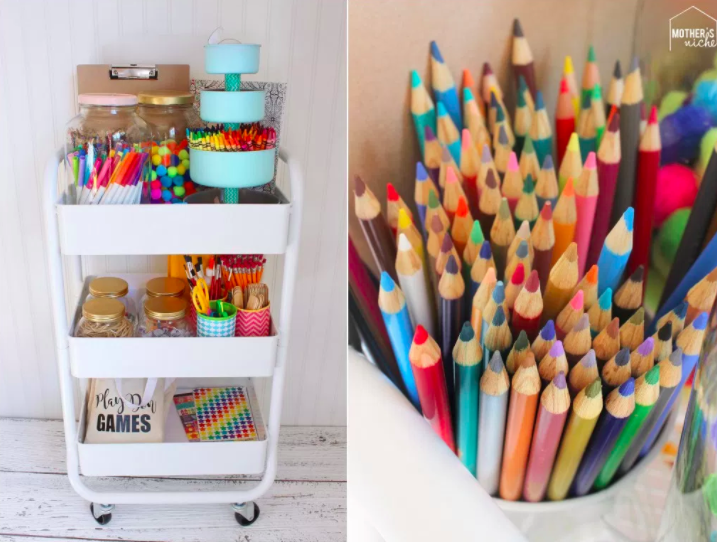 Although many of the blog posts on these talk about art carts for kids, they work perfectly for bullet journal supplies organization! I think they look lovely, the only potential problem I can foresee is if you have small children like me, your supplies will probably get pinched. The trolley I have my eye on is $41.88 on Amazon. Above: this pretty art cart is from mothersniche.com. I also love the pretty tins in there, it looks like the insides have been painted, as well as sticking the card on. Above: these pastel carts from lauravorlicek on Instagram are so pretty! She’s spray painted them with rustoleum paint, and also done some of the containers inside to match – love this! Cardboard Roll & Shoebox Supplies Holder! 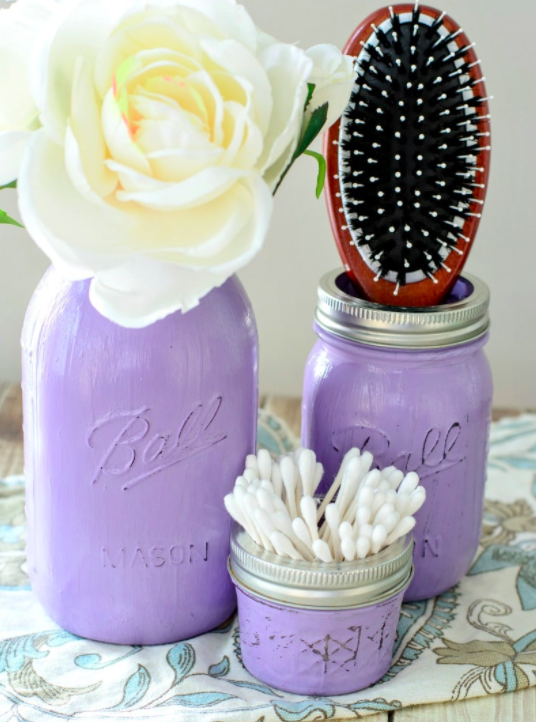 Is there anything mason jars can’t be used for?! Well yes, obviously there is, but they can be used for lots and lots of things. 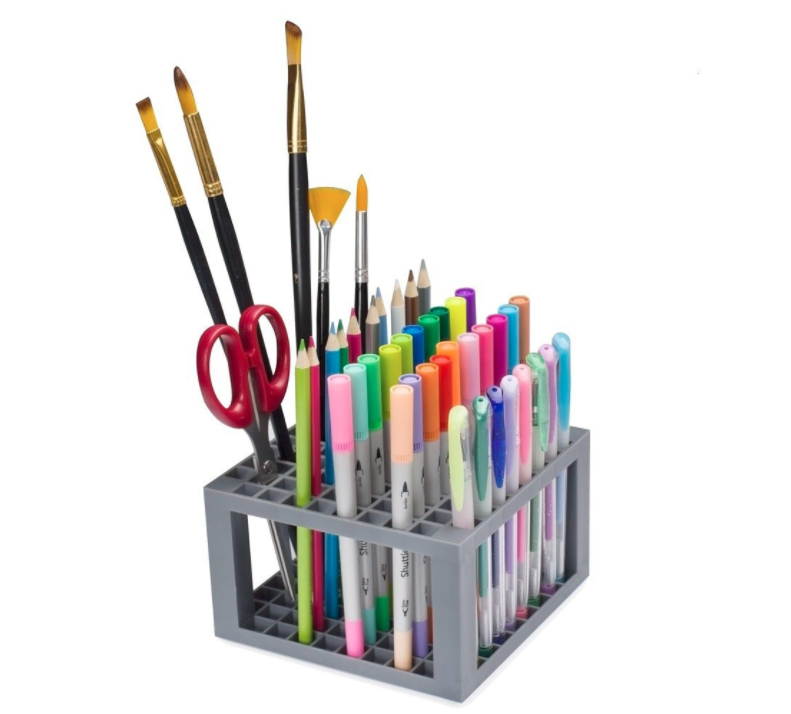 These will look lovely sitting on your desk too, but I’ve included them in this category because, unlike standard pen pots, you can pop their lids on to keep everything from falling out if you have to move them. Above: simple pretty painted mason jars on momdot.com. 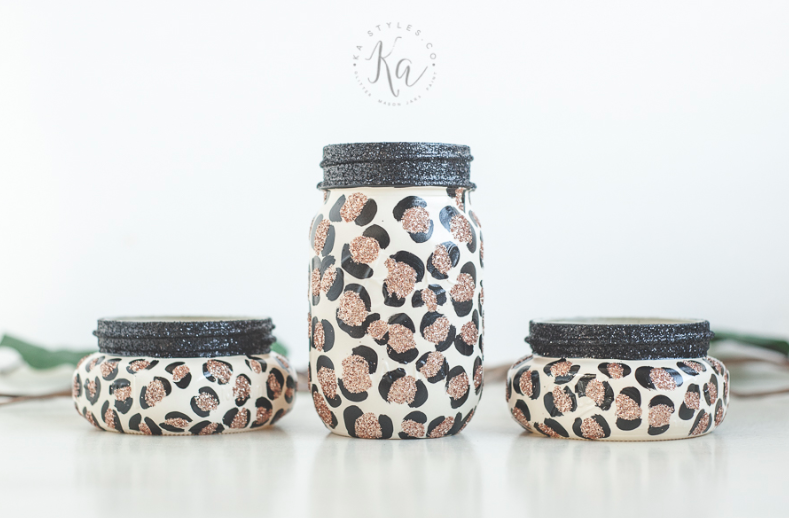 Above: These glitter leopard print mason jars are unique and stylish, and not too complicated to create yourself! They’re over on kastyles.com. 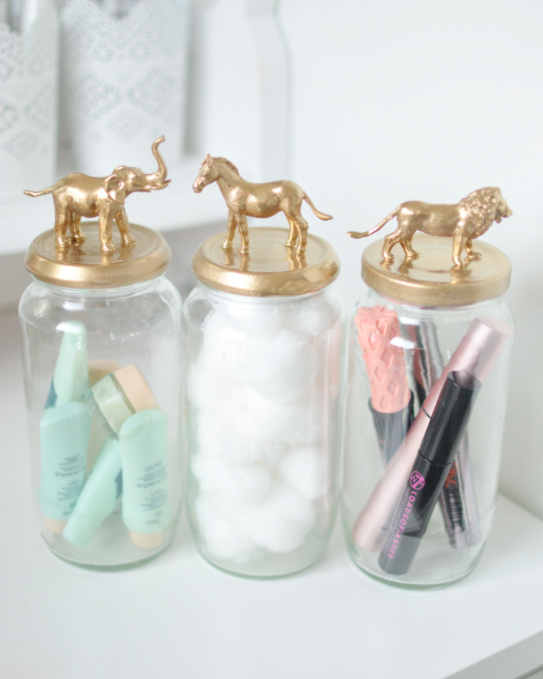 Above: I really want to have a go at making these gorgeous gold-animal topped mason jars! Although they’re expensive looking, they’re actually made by spray painting little plastic kid’s toys, so they’re very budget friendly! You can always pick up some good bargains on mason jars on Amazon. Not Just Any Old Pencil Case! And finally, don’t forget about good old pencil cases if you need to move your supplies around! But we’re not talking about your usual pencil cases here. 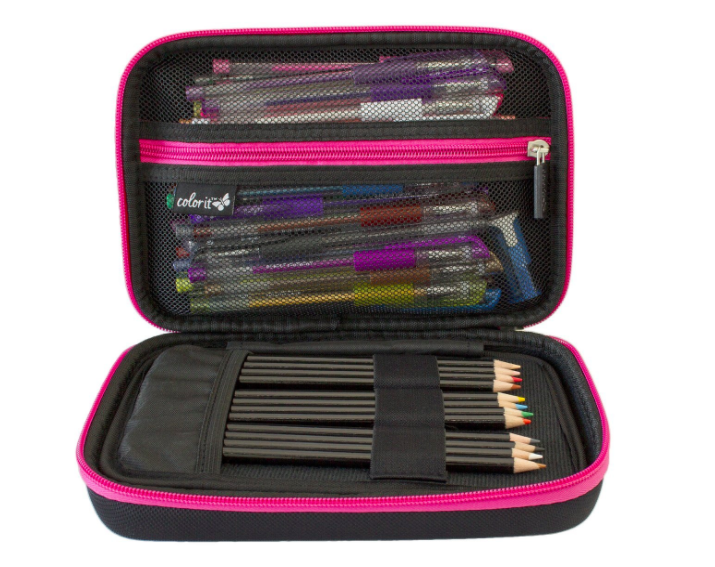 There are some fantastic options available, that can fit in more than you could ever have imagined a pencil case could hold! 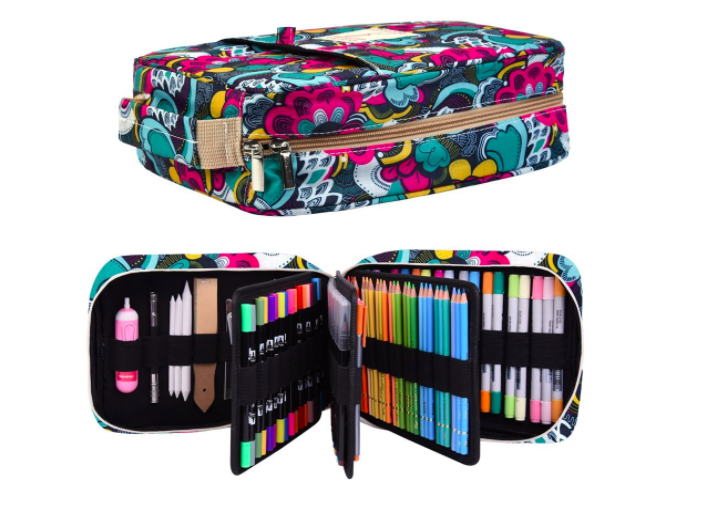 This huge pencil case will fit in 202 pencils or 136 gel pens, plus your other bits and bobs! $28.99 on Amazon. For a more traditional pencil case that still fits tons in, you can’t go too far wrong with this hard-shell carry case, $16.99. So there we go then! I hope you’ve found something to help you out with your bullet journal supplies organization within this little lot! I’m going to try to get my supplies sorted out, what about you? I’d love to know what you decide to do and whether you try out any of these ideas, let me know – bye for now! Enjoyed this post? Why not share it on Pinterest! 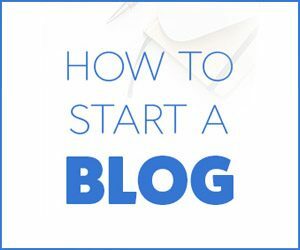 This is a beautiful post full of great ideas! Thanks for sharing these gorgeous tips! I’m definitely pinning this. Thank you Audrey, I’m so glad you enjoyed it! You can get the ‘art cart’ cheaper at IKEA if you have one near you. Thanks for the tips – great ideas!